Cream together butter and sugar until fluffy. Add hot coffee, set aside to cool. Stir in well beaten egg yolks and chocolate (add a dash of salt). Dissolve soda in vinegar and add. Finally, gently fold in stiffly beaten egg whites, making sure to incorporate the air. Grease and flour 2 8” cake pans and pour in batter. Bake in a slow oven (325°) about 30 – 40 minutes. Test for doneness with a toothpick. Note: If you want to do three layers, place them all on the same oven rack and cook for about 25 minutes. Test. This is a (Emily) frosting recipe I created for the cake. 28 comments on "Mahogany Cake"
A cake with a reputation! Can't wait to try this :D thanks for a great post! this looks...amazing. I can see what it's his fave cake. coffee, sugar, chocolate..count me in! I'd share my favorite recipes, but they're all from you! What a beautiful cake. I would like some for breakfast. Isn't chocolate the best thing ever? This looks delicious Emily. I love old family recipes. 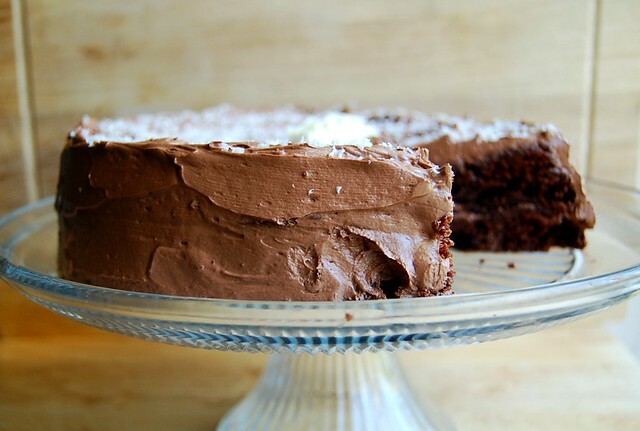 Ohhhhhh this cake looks like a chocolate heaven perfect for this season, when days are shorter and colder! 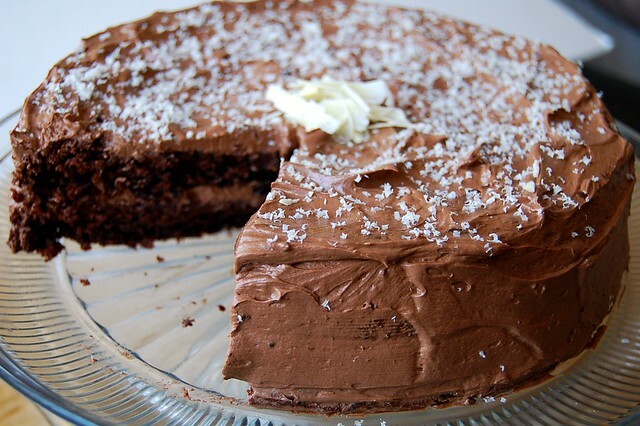 This looks like one delicious chocolate cake! Looks delicious! I wish I had a slice of this for breakfast! Interesting recipe. You add the coffee while still hot. YOu don't see that very often. I'd be afraid to try croissants too. Every once in a while I tell myself I will try to make my own puff pastry, but I chicken out. Man, that looks incredibly moist and delicious! this sounds so good, and the photos are gorgeous! it's 7am here, not too early for chocolate, right? So basically the idea is that you always have a cake in the oven or just hanging around ready to be posted about? I need to drop by. I love always-yummy recipes like that. It's interesting that there's no buttermilk called for. I bet the icing is fantastic, although I probably would swap out the milk chocolate for dark, but I like that you used cocoa too. That looks soo yummy. I might have to try this recipe. Thanks for sharing. Sometimes simple recipes like this are the best. Plus, any recipe passed down from a grandmother is probably pretty good. I haven't attempted croissants yet either. Some day! this sounds like something we would inhale. maybe i need to wait to make it for a big party so i'm not left with tons of leftovers. Emily... I am so thrilled!! You made my recipe and liked it! 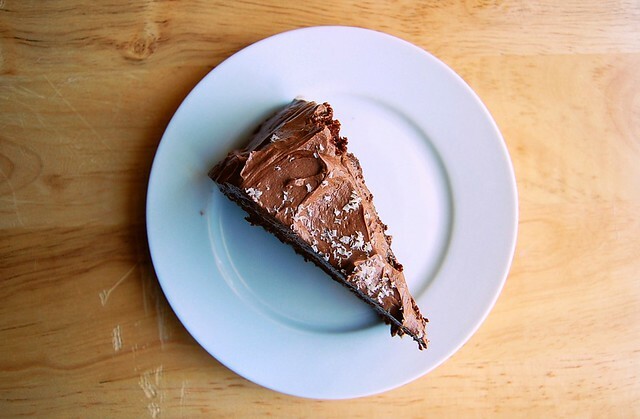 The texture of the cake tends toward dense but it still should be very moist. My cake is much taller than what I see in your pictures... I am not sure why. Your icing recipe looks delicious! I am going to try it ASAP. Thank you ever so kindly. My family will be excited to know that their grandmother's special recipe is being shared with the world. That is some serious chocolate-y deliciousness. I really wish I had some of that going on on my counter right now. Looks so yummy! What did you put on top of the cake? Wowza. I need some chocolate cake in my belly. Right. Now. This cake looks rich and delicious! I love the little touch of coconut on top...yum! 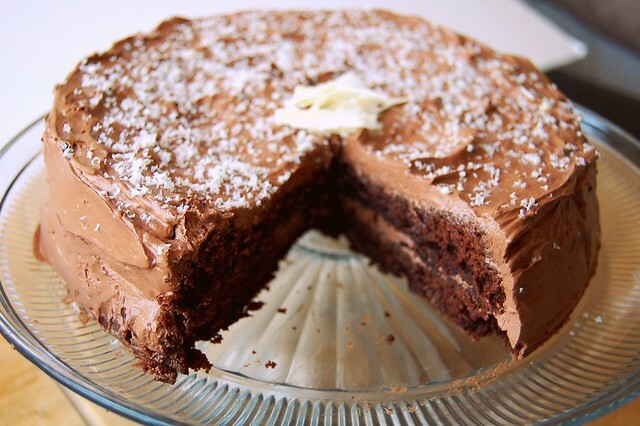 this is a chocolate lover's dream cake! i particularly enjoy the cake-to-gorgeous-frosting ratio. well done! Sue, I prefer dark chocolate, too. I had some milk chocolate on hand, so I guess that's why I used it. Brandi, that's a good idea. That's what I've been doing lately with my baked goods. Giving them away! Vocello, I'm not sure why I didn't get the right height... maybe I folded in the egg whites too much? The cake was very moist! Yum. Thank you so much! OMG such a gorgeous chocolate cake! I'd love to have a good slice! 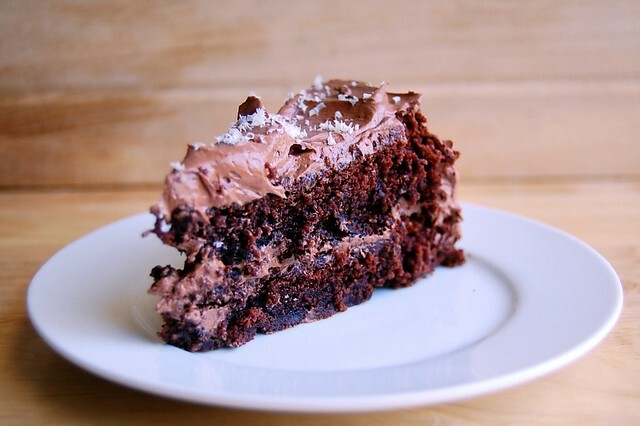 That is one pretty chocolate cake, and it looks SO rich and moist!!!! This recipe is very forgiving and so simple. The butter was too cold so didn't cream very well and I did not have chocolate so I substituted with cocoa powder. Delicious! I will try again with room temp butter and chocolate.